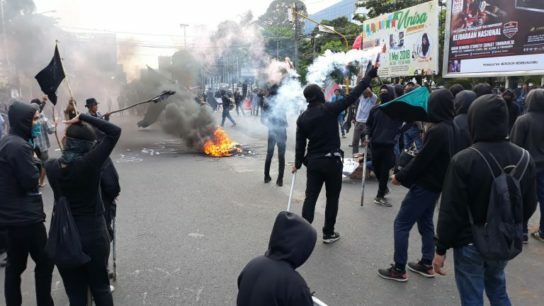 – One of the Legal Aid was arrested and beaten. – Until now our 12 comrades are still imprisoned and the police continuing the witch hunt. International solidarity for arrested comrades by whatever means necessary! 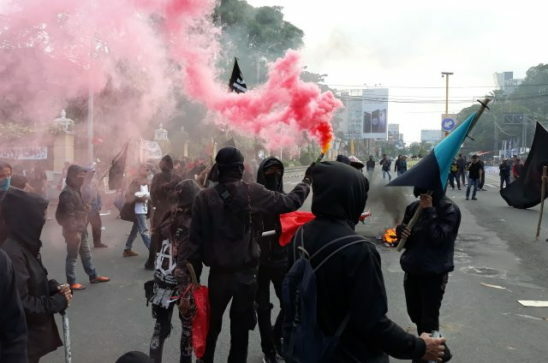 Although this is an exclusive communique towards Yogyakarta or Indonesians in general, we call for international pressure and solidarity against this rotten feudal system that still exist in this century! Greetings to the beloved people of Yogyakarta, those who vilify our demonstration which was intentionally intended to censure the institution of Kraton in Yogyakarta. Believe us when we say that we already knew, even since before we carried out our demonstration, that there would be an antipathy from the public towards our demonstration. It is very understandable. Feudalism creates this belief that kings and the royals are like half-divine beings; their authority is sacred and self-justified. Someone becomes a ruler in a feudal system because they happened to be born in the right family: the royal family. The whole feudal territory is the property of the king and his royal family, and the people are just occupants who can be evicted any time at the king’s will. The system is perpetuated by, among other things, this irrational belief towards the feudal rule. In Yogyakarta, feudalism is what makes Yogyakarta “special”. Politically, this special status means Yogyakarta is not governed by an elected governor like other provinces in Indonesia. Instead, the region is governed by a governor who is also a Sultan. Socio-culturally, this special status has another meaning; it gives a false sense of pride to the people of Yogyakarta. Yogyakarta is special because it is ruled by a Sultan, and the people are proud about it. How is being ruled by someone with an unchecked power something that you can take pride of? What is so proudful from being a subordinate of another human being, solely because they were born in the royal family? Our demonstration was not meant to draw sympathy. If drawing sympathy was what we were aiming, we wouldn’t have done a demonstration that disturbed the reproduction of social values like what we did. No, our demonstration was not intended for that. We are not a political party, a“leftist” organization, an NGO, or the proponents of the incumbent rulers or their oppositions, who need people’s endorsement and sympathy. WE ARE ALSO NOT PART OF PMII; FAIZI ZAIN AND HIS CRONIES WHO EXPECTED A RIOT TO LIFT THEIR AGENDA OF OVERTHROWING JOKOWI FOR THE BENEFITS OF THEIR POLITICAL MASTERS! THEY ARE POWER BROKERS! WE ARE NOT! Our demonstration was meant to disturb the circulation of capital in Yogyakarta. We intentionally want to create a non-condusive situation for capital investment, be it national or foreign, that will intensify the development and gentrification that disenfranchise the middle and lower class people in Yogyakarta. We had guessed that the public would be infuriated by our vandalism and provocative calls. 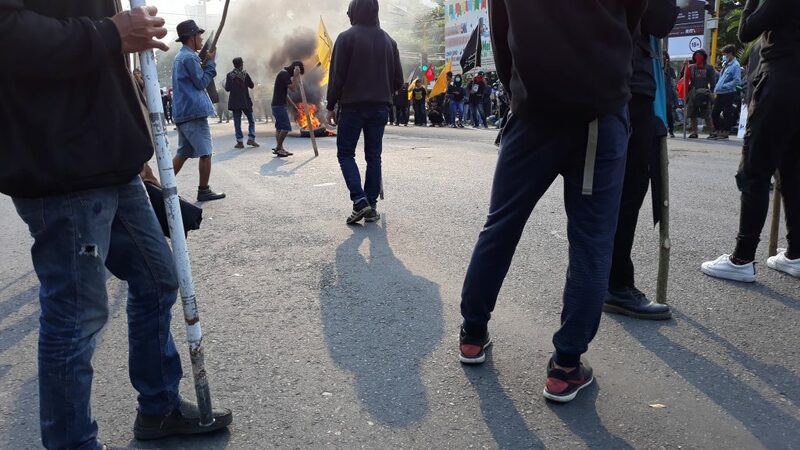 The destruction of one police post and the call to “murder the Sultan!” have massively angered the people of Yogyakarta. The anger is absent when the police repeatedly, with violence, is at the front line of conflicts between people’s interests and the rulers’, on the side of the rulers’ of course, like the one in Temon, Kulonprogo, where there is an on-going process of land-grabbing by the Sultan through the legitimization of Sultan Ground/Pakualaman Ground, a feudal land ownership system, on behalf of the expansion of tourism industry capital. The anger is also absent when the inhabitants of the urban kampungs (informal settlements, slums) have to deal with water shortage, caused by the usage of ground water by hotels and apartments, which construction is being intensified, under the blessing of the Sultan of course. That call to “murder the Sultan!” that have angered some people of Yogyakarta, whether we wrote down the call or not, whether the call was literal or symbolic, has its own importance in rattling the authority of the Sultan in Yogyakarta, which is seemingly sacred and unquestionable; a power with no control mechanism because it is protected by “faith” towards the Sultan’s self-justified authority. This “faith” is responsible for the disenfranchisement of the people. Soon er or later, you who are reading this will probably be disenfranchised by the “development” in Yogyakarta too. A “development” for the interests of the Sultan and his cronies; local and national corporations; domestic and foreign invetors. Yes, the Sultan is one of the main orchestrators of many problems in Yogyakarta; eviction, land-grabbing, gentrification, and the development that disenfranchise middle and lower class people. The Sultan and his royal family, and also his cronies, are the ones who dominate every economic aspect in Yogyakarta. Yogyakarta is one of the most economically unequal provinces in Indonesia. The development in Yogyakarta is not carried out for the interests of the people, but for the interests of the ruling class: the capitalists and the feudals. In Yogyakarta, the two vile sytems are having an affair, while crushing the people under; those who aren’t the royals and are the middle and lower class. Mothers, aren’t you tired of having to visit your children at prisons, twice a week, who probably had to steal or rob people just to survive? And the reason why they are in these overpopulated prisons in Yogyarta is the deeply rooted poverty that is prevalent in Yogyakarta. Does your Sultan care? And then, are we gonna keep fooling ourselves, thinking to ourselves that everything is fine? Or even, “special”? We have no interest in being admired. We are not a political party who need people’s votes on elections. We are just people who are sick. Sick of everything that is going on around us and how the people are lulled by this false consciousness, telling them that everything is fine. We’re calling to the middle and lower class people, intellectuals, artists, academics, those who claim to be liberals and moderates, and others who choose to be “neutral”. Do you remember the historical event that gave birth to the concept of modern nation-state? The period that you call the Enlightenment Period, where the kings, queens, and the royals were guillotined at the Place de la Révolution. Didn’t it create what you call as democracy? We don’t mean to repeat or glorify history. The democracy that you uphold and sell out is not bringing us anywhere other than to poverty, ecological degradation, and disfranchisement. We are the libertarians. We are what you call as anarchists. We dream of a world where people cooperate with each other, work together, rule over themselves, in a horizontal way, without rulers, the royals, political contract, social contract, or the capitalists. We want a life in its truest form, where human’s natural desires are in tune with nature; a life without class, racial, ethnic, religious, and other false divides. We are what you call utopists. We want a free society without oppressors. We want a society where people can have any beliefs, sexual orientations, or anything without fearing being persecuted.